The history of early China was first told by the two great historians, Sima Qian (145–86 BC) and Ban Gu (AD 32–92). Ban Gu’s History of the Han was the first work to deal exclusively with a single dynasty, and his record of the Han dynasty (AD 206–BC 220) remains the most important work to understand one of China’s foundational historical eras. Still today the Chinese identify themselves with the Han; Chinese language is called “Han language,” Chinese studies are called “Han studies,” and the Chinese race is called the “Han race.” Ban Gu’s representation of the Han era remains the standard historical lens through which the Han dynasty is studied and imagined. Ban Gu’s works, however, sweep far beyond his History of the Han, and by considering his entire oeuvre collectively, which includes historical records, poetry, and epistolary works, one can discern that he was not only a talented historian, but also a gifted poet and scholar who was well-connected with court politics. His works also disclose an intellectual desire to reconstitute former philosophical ideas regarding political legitimacy and the role of court ministers into a novel political philosophy. Ban Gu’s contribution to China’s historiographical and philosophical traditions is vast, and has largely influenced how history and literature have been produced since his death. Other than the History of the Han, Ban also produced several poems included in later Chinese anthologies, including the “Response to a Guest’s Jest,” and his “Rhym-Prose on the Two Capitals,” which features prominently in Xiao Tong’s (AD 501–531) famous collection of China’s finest poetry, the Selections of Refined Literature. His editorial role in the compilation of the Comprehensive Disquisitions at the White Tiger Hall (AD 79) is also noted in Chinese studies of early Chinese philosophy. While Ban Gu’s literary approach has been both praised and scrutinized by later critics, his influence on later historians and poets is unquestionable. While Chinese scholars have produced several studies devoted to Ban Gu’s contribution to our present historical and literary understanding of early China, very little has been said of his work in Western scholarship. Ban’s work continues to be consulted as a history of early China, but little effort has been taken to understand Ban Gu as a historical character himself. Even less has been done to question the reliability of Ban’s historical records, or to understand Ban’s intellectual motives for producing his history of Han China. Anthony Clark’s work draws first upon extant Chinese studies of Ban’s writing, and second, builds upon the scant Western studies so far available to the scholarly community. 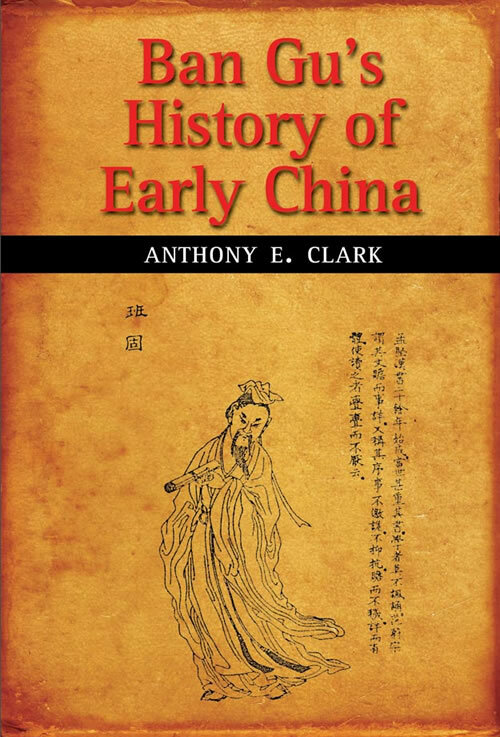 In this scholarly study, Clark investigates both the author, Ban Gu, and his works to explore how Ban’s personal context informed and influenced his depiction of early China’s history. In this first book-length critical study of Ban Gu and his works, Anthony Clark provides both biographical and historical information about Ban Gu and his political context, while also reflecting on how that context formed his portrayal of history. Clark’s book argues that the precarious position court scholars and ministers occupied motivated Ban Gu to restructure long-hallowed Confucian political ideas into an entirely new notion of Heaven’s Mandate (tianming). Unlike the earlier model, which held that Heaven assigned or removed its sanction based upon moral merits, Ban’s new Mandate model held that the ruling dynastic family’s Mandate was permanently bestowed, and thus irrevocable, regardless of the ruler’s good or bad behavior. This book offers new insight to previous scholarly assumptions regarding the ancient Chinese idea of Heaven’s Mandate, while also providing historical information about Ban Gu and his family during the Han dynasty. Ban Gu’s History of Early China is an important book for anyone interested in the history, philosophy, and literature of early China.